Sign language is typically used by individuals who are deaf or hard of hearing. But they are not the only ones who speak this language. It’s a great language to learn even for a person who can speak verbally. Children are especially adept in learning and using sign. I used to work with a dear friend who cannot hear or speak verbally. I started learning from her so that we could talk. I did go on to take a couple of local informal classes. Now I have trouble speaking. My vocal chords have been damaged from radiation treatments. They just don’t work any more, so I try to communicate with people using the language of sign. My family doesn’t know sign language so I also try to teach them some of the basics. Whether you know it or not, you also know some sign language. 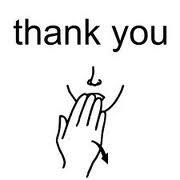 We often wave “hi” to people, or use motions with our hands when we talk. Some of those motions are actually part of the language. I don’t want to offend anyone, but I love to watch people who sign. It is such an expressive and beautifully flowing language. According to the National Institute on Deafness and Other Communication Disorders, sign language is a complete language with its own distinct rules of word order and grammar. Communicating with sign language is so much more than just using your hands to make motions. Spatial placement of your hands is essential. The same motion may mean something different simply by changing where your hands are as you sign. Your facial expressions and body language are equally important. For example, if you ask a question your hands will sign the correct motion as you will tilt your head slightly to the side, and raise your eyebrows. Or if you are angry your face will show the anger through furrowed eye brows and probably a firm set of your lips. Your hand movements will be stronger as well. 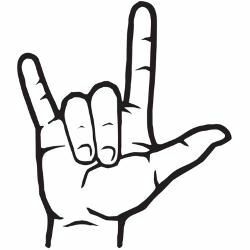 If you want a useful tool to help you in learning some sign, I suggest these: American Sign Language Dictionary and The Joy of Signing. I use them both a lot. The dictionary is not the most exciting read in my library, but both books are very useful. The illustrations are easy to follow. They also include some of the history or origin of the signs. Click here to purchase this dictionary. Try learning some sign language. Incorporate some signs into your spoken language. Learn to speak with individuals who cannot hear or speak verbally. Enjoy a unique and beautiful language.